Svaneke is a small town on the eastern coast of the Baltic island of Bornholm, Denmark.It is Denmark's easternmost and until few years ago the smallest and now the second smallest chartered town with a population of 1,059 as of 1 January 2014. With its charming half-timbered houses and narrow streets, it is one of the island's most cherished beauty spots.HistorySvaneke probably dates back to the 13th century when herring fishing was practiced along Bornholm's east coast. The precise date at which it was granted the status of market town is not known but it was no doubt at the beginning of the 16th century as by 1543 it had a mayor and a municipal council. In 1610, almost half the town was destroyed by fire. 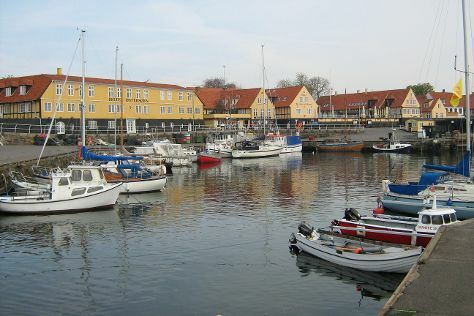 In 1801, the population was still only 663 but this figure doubled in the 19th century as the new harbour (1816) provided enhanced opportunities for shipbuilding.It was in the 18th and 19th centuries that trade and shipbuilding expanded in Svaneke, resulting in the construction of the fine merchants' houses which still line the harbour. Unlike many of the other towns on Bornholm, Svaneke escaped modernization following the opening of the island's railways at the beginning of the 20th century. Its old-world look was further protected towards the end of the century by "The Friends of Svaneke" who prevented inappropriate renovation work.TourismSvaneke owes its current prosperity to tourism, thanks to the well-preserved town centre which earned it the European Architectural Heritage Gold Medal in 1975. In particular, the quaint red-roofed, yellow lime-washed, half-timbered houses lining the narrow streets which wind down to the harbour and up to the church are a special attraction. The town is also a centre for arts and crafts with everything from glassblowing to ceramics, not to mention a couple of small sweet factories and even a miniature brewery. Svaneke is in Bornholm. Use our custom trip planner: Svaneke and all its delights await.